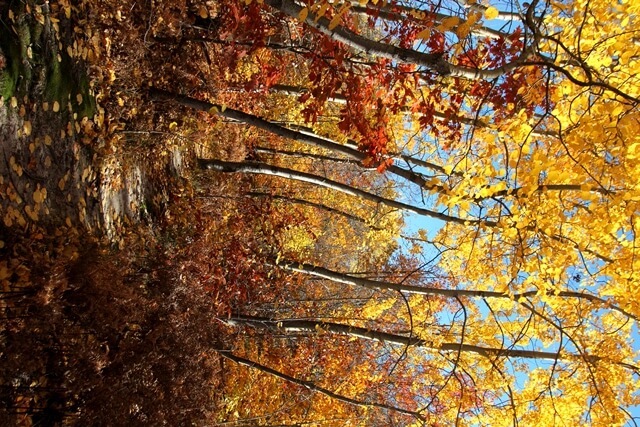 Hiking at Leelanau Conservancy Natural Areas brings visitors up close and personal with the stunning beauty that is a Leelanau Fall. Photo by Maia Hausler. It is difficult to pick a favorite season in Leelanau. The cherry blossoms of spring, sun-drenched beaches of summer, and glistening ice of winter all offer up stunning scenery to Leelanau visitors and locals alike. But it is the brilliant reds and golds of autumn that are the real sight to behold. Just like the other natural wonders of Leelanau County, the spectacular sight of changing fall colors can be easily seen from any roadway. 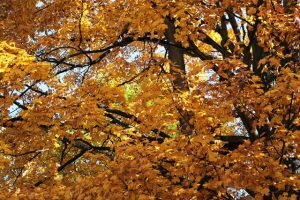 But to truly experience the autumnal beauty Leelanau has to offer, one must get off the paved track, head out into the wilds, and spend a moment under a canopy of leaves. The Natural Areas and Preserves of the Leelanau Conservancy offer ample opportunity for fall color viewing throughout the season. Founded in 1988, the Leelanau Conservancy has since permanently preserved over 13,100 acres and established 25 Natural Areas and Preserves with almost 15 miles of trails. These Natural Areas and Preserves are free to access and most are open to the public. We recommend visiting these special wild places, even when the fall foliage is not yet on the trees. While the opportunities for seeing color-changing leaves abound at every one of our Natural Areas and Preserves, Leelanau Conservancy staff and docents have selected five outstanding Natural Areas for viewing fall color. These memorable spaces offer unique features that make the viewing experience at each truly exceptional. The fields and forests of the DeYoung Natural Area offer stunning panoramas of autumnal hues set amongst a historic farmstead. Photo by Ken Scott. The DeYoung Natural Area combines an historic farmstead with a mile of shoreline along Cedar Lake. Hikers will experience red barns and heritage farm buildings against a backdrop of fall leaves and fields dotted with old twisted apple trees. The open fields of the farmstead offer stunning panoramas of autumnal vistas in a pastoral landscape. The woods are full of oak, black cherry, maple, poplar, and basswood trees and the fields play host to goldenrod, early fall berries, and an array of colorfully hued vegetation. The Universal Access Trail along Cedar Lake provides a great vantage point for viewing the reds, oranges, and yellows of autumn contrasted against the deep blue of the water. It is ideal for those using wheelchairs or strollers. The farmstead, which dates back to 1870, was named for innovative farmer Louis DeYoung and his family, who were integral to its preservation. The property provides essential protection for shoreline wetlands critical to the health of Cedar Lake. It was preserved in 2006 with support from the Michigan Natural Resources Trust Fund. A .5 mile Universal Access Trail leads to a Cedar Lake fishing pier, and the 1.5 mile upland trail system meanders through the historic farmstead. A heron rests in front of a backdrop of fall foliage at Kehl Lake Natural Area. Photo by Richard Gans. This peaceful Natural Area on the northern tip of the peninsula is known for being a birder’s paradise and falls within a critical flyway for migratory birds. In the fall, a mélange of water fowl land on the pristine lake and its shoreline, three quarters of which are protected. 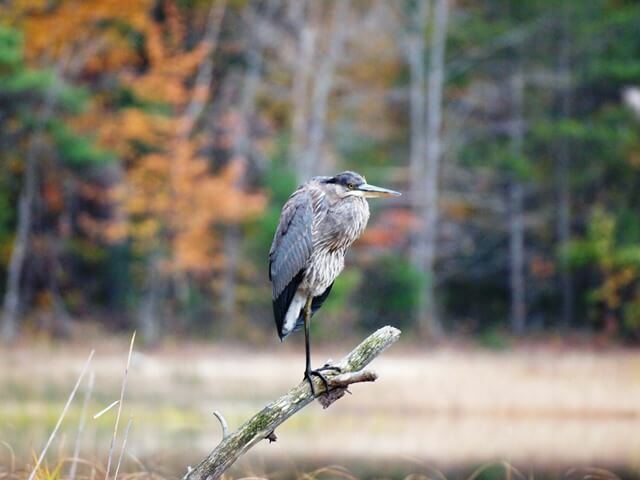 Walking through this expansive forested wetland in the fall, visitors will view the changing leaves of old growth trees and towering birch against a backdrop of majestic white pines and hemlocks. A viewing platform (partially submerged underwater, rubber boots are recommended for reaching it) provides views of water-loving wildlife and fall color across the lake. The land surrounding Kehl Lake was once home to Ottawa and Chippewa settlements. In the 1860s, the Kehl family began to farm the Southern part of the property. The Natural Area was preserved in 1992 and is part of an extensive network of preserved lands at the tip of the peninsula that serve as an important corridor for wildlife. This 2 mile trail network traverses moderately sloped terrain and wetland areas with boardwalks. Boots are recommended for reaching the section of the trail that leads to the viewing platform on the Lake. 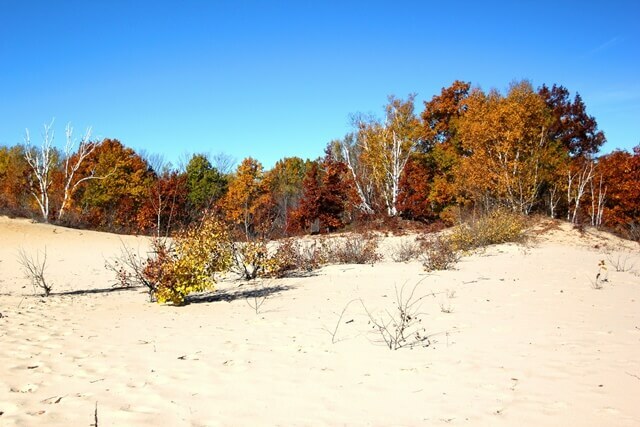 Spectacular any time of year, the Houdek Dunes Natural Area particularly shines in the fall, when its diverse array of ecosystems give visitors a constantly changing show of colors throughout the entire season. It is a living example of the wonders of dune succession, with terrain that continues to shift and change. This varied landscape is home to a myriad of tree species known for their brilliant autumnal hues, including unusually old white birch trees, strands of aspen, ancient maples, oaks, beech, cottonwoods, and the unique tamarack, a deciduous conifer with “needles” that change to bright gold in the fall before they drop. Understory plants and shrubs such as staghorn sumac help to round out the autumn color display. The land, located just north of Leland along M22, was owned and partially farmed by the Houdek family over a century ago. Duneside apple trees remain from an old orchard, and fence posts indicate that the Houdeks probably grazed cattle here. With the help of many, the Conservancy acquired Houdek Dunes from a developer in 1998, preserving this fragile network of wetland and upland ecosystems. This 3 mile trails system on sloped terrain has multiple loops and includes sandy trails and stairs. 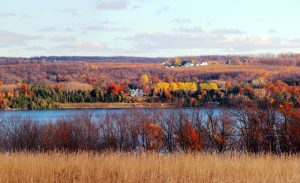 At Clay Cliffs Natural Area, views of fall leaves along both Lake Leelanau and Lake Michigan give visitors a quintessentially Leelanau experience. Photo by Trish Petrat. 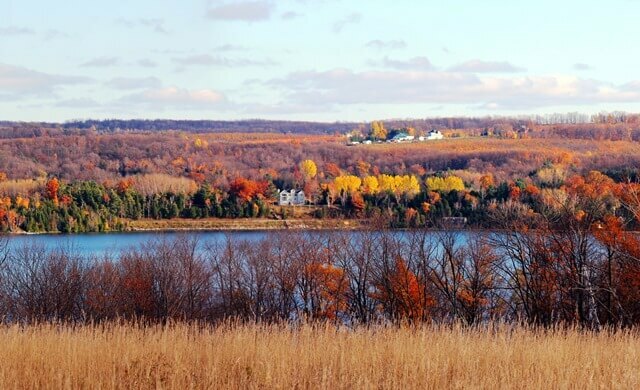 Offering dazzling views of both Lake Michigan and North Lake Leelanau, the Clay Cliffs Natural Area will enchant visitors with its panoramic vistas full of brilliant fall color. Hikers climb through a canopy of maple and beech and emerge into a rolling field, providing them a glimpse of sparkling Lake Leelanau over a band of autumnal foliage. Sheer clay cliffs on the Lake Michigan side of the property are home to a viewing platform; the perfect location to watch a golden sun dip below the horizon while standing amidst equally golden woodland. These clay bluffs host a rare and fragile ecosystem where eagles swoop over the lake in search of prey. This stunning Natural Area was created in 2013 in partnership with Leland Township with support from the Michigan Natural Resources Trust Fund; protecting over 1,700 feet of shoreline on both Lake Michigan and Lake Leelanau. This 1.5 mile trail system includes both flat and hilly terrain. 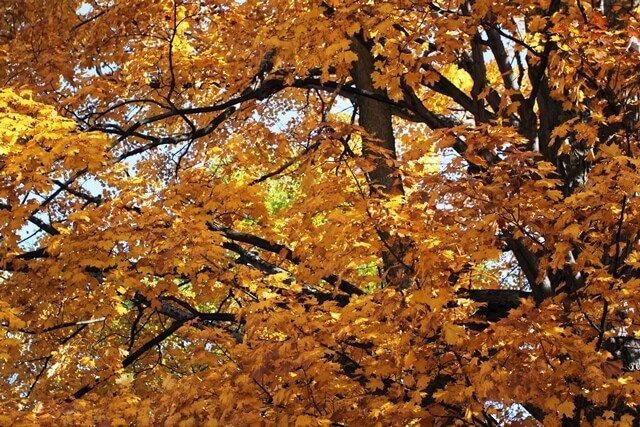 The forest canopy at the Krumweide Forest Reserve provides an array of golden hues. Photo by Maia Hausler. Perched on top of a high ridge between two scenic pastoral valleys, this forest reserve offers mild to steep terrain and views from the understory of a northern hardwood forest. 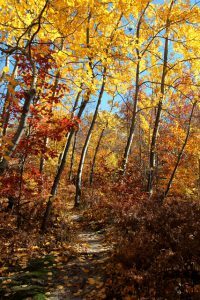 Hike past colonies of golden aspen, and through a forest flush with sugar maples, American beech, hemlock, and red oak. Follow the old logging road or take the ridge trail to experience the hills as the early European settlers did. As leaves begin to fall visitors may even catch a glimpse of Good Harbor Bay. This is a great Conservancy property for viewing the traditional fall color display Leelanau County is known for. In 2007 the Krumwiede family donated the land outright to the Leelanau Conservancy, making it their first property designated as a working Forest Reserve: land that is actively being managed as a sustainable, healthy forestland and is periodically harvested for timber. This 2 mile trail on mild to steep terrain includes a gradual accent to the ridgeline and a steep descent back to the valley floor. 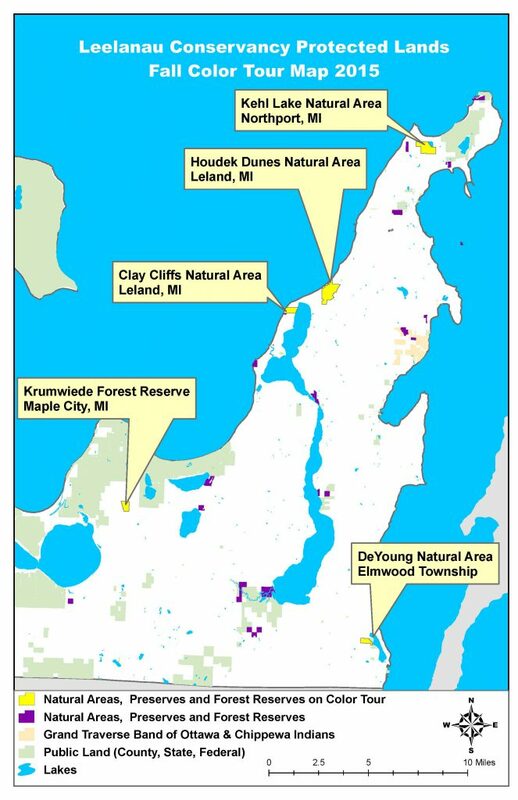 For maps, directions, and more information about the Leelanau Conservancy, our Natural Areas or guided hikes, please visit leelanauconservancy.org or call our office at 231 256-9665.